Its no secret I love what I do, I’m incredibly fortunate to be able to do what I love daily, bringing Pilates into the lives of a wonderful diversity of individuals, all of whom inspire and teach me on a daily basis. Like any passion it can be all consuming. My days are long, I start between 6.30 and 7am and finish at 9pm every day. I’ve only just dropped from 6 days a week teaching to 5, burnout in my industry is common. I’m in no way complaining, as I’ve already said I have a passion for what I do and high energy levels but sometimes we all need to look at where we are, the more we have in our day to day lives the faster the days go. Before we know it we’ve missed the wonderful scenery along the way. 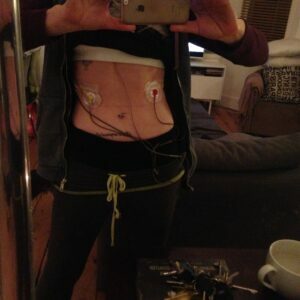 I recently underwent Cardiac tests, an echocardiogram and an ambulant ECG over 48 hours, teaching wired up was an interesting experience, so far I’ve discovered the structure of the heart muscle is healthy, there had been concerns due to my history with disordered eating and the fact my father died of a heart attack at 45. So far I’ve yet to hear back on the electrics but fingers crossed the feedback will be good. Being incapacitated when the body is potentially vulnerable is always a time for reflection and I found myself reconsidering my health in many ways. A year ago my life changed in ways I could not have predicted. I reconnected with my best friend from childhood, we fell in love, bought a house together within months and in three months from now we will make a commitment to each other in front of our family and loved ones. Its been a whirlwind but my life often is and the truth is I wouldn’t have it any other way. So given that I teach a method that embraces the health of the body, mind and spirit (if Pilates didn’t lift mine there’s no way I would do it, let alone teach it!) my little cardiac speed bump has led me to question what I want from my life. Instead of getting frustrated by my enforced slow down I decided to consider if I was in the best place professionally as well as emotionally. I’ve known for some time I needed my own studio space, somewhere to practice, explore, play, quiet time, silly time. Somewhere to take my clients into even more of their bodies potential, somewhere I could share the feeling I get when the body, mind and energy come together to create something profound and life changing. The Pilates body is not simply a size ‘X’ or someone you see paraded endlessly on Instagram or Facebook, the Pilates body emanates the Heartbeat of the Method and the pulse goes through us all in different ways, the benefits are many and varied to ourselves and our clients but only if we see it as part of our lives and not all of our lives. I’m fortunate enough to be with someone who supports my passion and ability to do what I love but who has shown me that lazy days are as good for the heart as working and workout days.